It's a broad church, R&B. Yet when you bring the distinctive sounds of Usher, Alicia Keys, Kanye West and Rihanna together you realise that what they share goes beyond music. There's a heart and soul and faith in R&B you don't find anywhere else - but you can get closer to it with R&B music memorabilia. If R&B wears its emotions on its sleeve, R&B memorabilia lets you put those emotions on your wall. Classic albums. Classic artists. Classic names creating powerful music - and you can display those R&B music collectibles as talking point, collector's piece or prized possession. Own a photograph signed by your R&B hero or heroine and it's precious. Frame it and it becomes a piece of R&B memorabilia you can display, safe in the knowledge it's protected. Ask us about a framing service that keeps your signed photographs, albums, programmes and more in pristine condition. We're committed to authenticity and work hard to ensure all our R&B music collectibles are genuine. 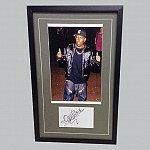 We're also committed to keeping our prices low, so every fan has a chance to own a perfect piece of R&B memorabilia. Find yours today.